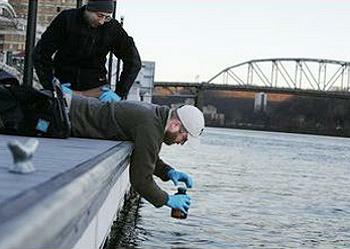 CHARLESTON, West Virginia, February 7, 2014 (ENS) – Crude MCHM, one of two chemicals that leaked into West Virginia’s Elk River last month, was detected in the water supply of George Washington High School this morning, according to Kanawha-Charleston Health Department officials, weeks after the water was declared safe to use. But Nassandra Wright, the Kanawha-Charleston Health Department’s head sanitarian, said the school’s results are below the Centers for Disease Control and Prevention’s recommendation of one-part-per-million. George Washington is the latest of more than a dozen Charleston schools to be affected by water contaminated by the January 9 spill of the coal-cleaning chemical from a Freedom Industries tank, just upstream from the West Virginia American Water utility, which supplies drinking water to Charleston. About 10,000 gallons of MCHM, which has a licorice-like odor, spilled into the Elk River. The chemical entered about 1,700 miles of pipe along the river, according to local officials. Information on its toxicity and health effects is scarce. A Do Not Use the water order issued January 9 affected more than 300,000 residents in nine counties, but after 10 days the water was declared safe to drink. Still, reports of water contamination keep flowing in to state officials. George Washington was one of five schools whose water tested positive for low levels of Crude MCHM in tests conducted by the West Virginia National Guard, even after the system was flushed in late January. Water systems at the five schools were re-flushed and re-tested; the levels of Crude MCHM then fell below both the federal recommendation and the stricter state standard. But this morning the tell-tale licorice odor was back, and students and staff reported symptoms that included burning eyes, light-headedness and headaches. Three schools in Charleston closed early Thursday after chemical odors were detected in their tap water. Dr. Rahul Gupta, head of the Kanawha-Charleston Health Department, said the county received complaints from a total of 14 schools. The assurance came in a joint federal-state agency news conference called to provide a detailed update regarding the Elk River chemical spill. But even Governor Tomblin is not 100 percent convinced that the water is safe to drink. He has told residents that the decision of whether or not to use the water is a personal, individual matter. After he made that announcement, news broke that crude MCHM can break down into formaldehyde, a known carcinogen. “And that means the Marriott Hotel. That means our Town Center Mall. No restaurant is allowed to open because you can’t legally open without water. And it’s been devastating for our area. People are in their homes. The schools are closed. You’re not supposed to take showers and certainly not supposed to drink the tap water,” said Jones. A federal grand jury has started a criminal investigation into the chemical spill in West Virginia, looking into the activities of Freedom Industries and the West Virginia American Water Company. On January 30, the National Science Foundation awarded $150,000 in Rapid Response Research grants to teams at three universities to investigate the spill. Water towers and storage tanks can be lined with polymer materials, including epoxy linings. These linings may absorb organic chemicals and then release them to later contaminate the water, he said. Jennifer Weidhaas of West Virginia University will assess the extent of the contamination in drinking water, the treatment plant and areas near the river. Andrea Dietrich of Virginia Tech will study the physical and chemical behavior of MCHM itself in the environment, which will add data necessary to model the environmental fate of the chemical. Together, the three studies present a systems approach that the National Science Foundation says will provide a better understanding of how MCHM behaves in water systems.